This game has already been played, but stay tuned for further details about Liverpool tickets and hospitality for the remainder of the season. Entertain your important clients and experience official Liverpool v Brighton & Hove Albion hospitality packages at Anfield. Brighton and Hove Albion will be looking for better results than they got in the 2017/18 campaign against Liverpool. Liverpool scored nine goals across the two fixtures, beating then 5-1 away and 4-0 at Anfield. This game will take place on the final day of the season and could be crucial to both teams. We are delighted to offer exceptional Liverpool hospitality packages at Anfield for the 2018/19 season. Soak up the atmosphere and passion that Anfield is renowned for with a Liverpool hospitality experience, and enjoy the match day as a VIP. Whether treating your important clients to a day of Liverpool hospitality, or celebrating a birthday, we are sure we have a Liverpool hospitality package to meet your requirements and make for a truly memorable experience. Thrilling football and top-flight hospitality awaits. Enjoy a VIP experience at Anfield with official Liverpool v Brighton & Hove Albion hospitality packages inside the Premier Club. Located in the recently renovated Shanks and Paisley Suites (named after the two most successful managers in the history of Liverpool FC) the Premier Club offers guests the perfect chance to enjoy the renowned match day atmosphere at Anfield alongside first-class corporate hospitality. Whether entertaining valued business clients or family members, the Premier Club offers an unforgettable Anfield experience including seating in the Executive Section of Kenny Dalglish Stand, delicious food, half-time and full-time refreshments and much more. Enjoy VIP Liverpool v Brighton & Hove Albion hospitality packages at Anfield from the Premier Lounge in the new Main Stand. These luxurious packages allow you to soak-up the fantastic atmosphere at one of the world’s most iconic grounds. Guests can see all the action on the pitch from your elevated seats in the main stand along with four-course menu, complimentary bar and former Liverpool FC player in attendance. This is the package to make your match day at Anfield truly unforgettable. 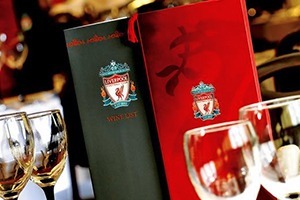 Enjoy watching your team win in style thanks our range of Liverpool Hospitality packages at Anfield. Splendid views, fantastic food and the finest facilities combine to create an experience that will never be forgotten. Having been a Liverpool fan all of my life, this was my first time in an official hospitality facility. From start to finish the day was excellent – I will be booking again! To sum my experience up in one word it would be ‘excellent’. The day ran so smoothly, the hospitality, facility and football was excellent.